However, sometimes a cliché does the best to convey the narrative. Friday night, it was an inch, not inches that separated Spring-Ford from a momentous early season victory, as Spring-Ford quarterback Stone Scarcelle was stuffed fractions away from the goal line on a two-point conversion in double overtime, sealing the game for District 3 powerhouse Wilson and sending the Rams home with a 41-40 defeat. Evident on the last play, neither team had anything left in the tank. Following Grayson Kline’s one-yard keeper that put Wilson up 41-34 in the second overtime, Spring-Ford wasted no time in getting even. Selwyn Simpson barrelled his way for a 10-yard score, taking a Wilson defender three yards into the end zone with him, to make it 41-40, prompting a Ram timeout. There was no question – the Rams were going for two. Scarcelle lined up at quarterback with running back Selwyn Simpson to the right, took the snap and ran the read-option before keeping it himself and bulldozing his way right into the heart of the Wilson defense. Scarcelle’s helmet got in on the initial push, but Wilson defenders were right there to make sure that was all that got in. Trying to reach the ball over the plane, Wilson kept Scarcelle an inch short, prompting jubilation on the sideline as Bulldog players rushed the field. Ram players sunk. They had nothing left in the tank. Wilson came away with the win despite committing 14 penalties for 133 yards. Players like Kline and Alex Twiford were the reason why. Kline entered the game on Wilson’s last drive and engineered a beauty, a 10-play, 68-yard march that brought the Bulldogs in range of kicker Nick Borelli, who calmly booted a 29-yard field goal at the end of regulation to send the game into overtime. Kline finishing 7-for-11 with 80 yards. “To come in cold and march us down the field. It was huge,” Wilson head coach Doug Dahms said. “That’s the beauty of having a two-quarterback system. Spring-Ford’s Matt Gibson and Selwyn Simpson shined for the Rams. Gibson finished with 112 yards rushing on 24 carries, a true workhorse effort. Simpson lit up the scoreboard, rushing for three touchdowns, his 37-yard run up the gut giving the Rams a 24-21 lead in the third. Simpson finished with 85 yards rushing on 15 carries. Big D >> The Rams defense, despite allowing 469 yards of total offense, was a huge reason why the game stayed tight. Led by the play of Dan Cassidy, Tanner Romano and Nick Salomone, the Rams ‘D’ kept the Wilson offense out of the end zone in crucial moments, limiting them to a field goal after the SF quarterback threw a interception deep in Ram territory. The defense also started the team’s comeback, registering a safety after a beautiful special teams play pinned Wilson down at the one. The safety made it 21-16 in the third before Simpson’s aforementioned touchdown made it 24-21. “They came up huge all night,” Brubaker said of his defense. “We had a couple turnovers in our own territory. One time they held them to a field goal, the other they just held them. There are guys just running on empty making plays. Staying Cool >> Spring-Ford kicker Erick Rodriguez, hit a 30-yard field goal to give the Rams a 27-24 lead midway through the fourth. Borelli was not to be outdone, hitting a 26-yarder to tie it at 24 before tying the game at 27 as time expired with a 29-yard boot. Doug Dahms has been involved in some remarkable games during his long tenure on the Wilson football staff. The one the head coach oversaw Friday night at West Lawn will rank among them. "It's been awhile," said Dahms of the last time he was involved in a game quite like this one. In a back-and-forth thriller, Wilson outlasted Spring-Ford 41-40 in two overtimes, securing the win by stopping the Rams just short of the goal line on a two-point conversion try. In a game that lasted more than three hours and included 10 touchdowns and almost 800 yards of offense, Wilson's Nick Borelli kicked a tying 27-yard field goal on the final play of regulation after quarterback Grayson Kline scrambled out of bounds with two seconds left. The teams scored touchdowns on both of their OT possessions from the 10-yard line, the Bulldogs (2-0) getting their second one on a 1-yard sneak by Kline on fourth down. The Rams (2-1) scored on their first play of each extra period, the second on Selwyn Simpson's third TD run. After the second score, former Wilson assistant and Spring-Ford head coach Chad Brubaker elected to go for the win, but the Bulldogs stopped quarterback Stone Scarcelle inches from the goal line to set off a wild celebration. The Bulldogs won despite being penalized 14 times for 132 yards, taking a safety and turning the ball over deep in Rams territory. "Don't take anything away from Spring-Ford; they played great football," said Dahms. "But we made enough mistakes to last the rest of the season. What'd we have? A hundred yards in penalties? You can't do that." Both teams had to rally, the Bulldogs doing it first after the Rams went 67 and 66 yards on their first two series to open a 14-point lead. Wilson quarterback Connor Uhrig put his team ahead by going 10-for-13 for 193 yards in the first half, with touchdown passes of 33 yards to Iggy Reynoso, 29 yards to Brian Wright and 38 yards to Foday Jalloh. The Rams turned the game around with the safety after pinning Wilson at the 1 on a punt, then got a long return on the free kick and a 37-yard TD by Simpson on the next play. There were three field goals the rest of the way, the last by Borelli when Kline - who took over when Uhrig was injured late in the fourth quarter - completed 5-of-7 passes to drive the Bulldogs from their 20 to the Spring-Ford 12. "I think it speaks to both programs' resiliency," said Brubaker. "We always strive to play four quarters. There's guys in that locker room that are hurting, and they kept going out and playing one more play. You can't ask any more of them." That factored into Brubaker's decision to go for the win. "We went for two because we didn't have much gas left in the tank," said Brubaker. "I asked the kids and I asked the coaches and they said we've got to go for it now." Hold the icing: There are no cupcakes on Spring-Ford or Perkiomen Valley’s schedule this season. Both the Rams and the Vikings have taken advantage of the new scheduling format brought upon by the PAC realignment, and on Friday, both face season-defining tests. Rams head coach Chad Brubaker makes his long-awaited return to West Lawn as the Rams square off against perennial state powerhouse Wilson while Perkiomen Valley looks to go 3-0 as Pennridge, the No. 8 ranked team in Southeastern Pa., comes to Graterford. For Week 3 matchups, those are pretty sweet. “I think we’ve had a bunch of challenges this year,” Perkiomen Valley head coach Rob Heist said. “Downingtown West was a very good football team. This (Pennridge) is an excellent team. They have size, strength, speed, quarterback play is terrific, really good inside linebackers. It will be a real good challenge. Brubaker returns to West Lawn for the first time during the regular season since departing to take over the Spring-Ford program in 2010. Brubaker spent 12 years as an assistant coach for the perennial state powerhouse, the last four as the offensive coordinator under head coach Doug Dahms. He was instrumental in the development of former quarterback Chad Henne, who went on to have an outstanding career at Michigan and started for the Miami Dolphins, and for the blistering Bulldog offense that set school records in virtually every offensive category, including yards rushing and passing, total offense, and points scored. Despite his long history at Wilson West Lawn, Brubaker insists that Friday night doesn’t mark a return home. He gets the story angle, but too much has changed in six years. “I told my kids that this is about them,” Brubaker said. “They (Wilson players) don’t know who I am or who coach Brown (former Wilson defensive line coach Victor Brown) is. I get why people would be interested in me at Wilson, but it really doesn’t have anything to do with Friday night. What isn’t different is the Bulldogs’ status among the state’s elite. The Bulldogs have run roughshod over their Lancaster-Lebanon opponents, compiling a record of 56-0 in the league (97-12 overall) and have won three District 3-AAAA titles since 2008 under the guidance of head coach Dahms, whose beard alone deserves a trophy. This stands as Spring-Ford’s toughest regular season task yet and will quickly serve as a measuring stick for the growth of a dominant defense that’s allowed just 214 yards per game (Dan Cassidy with two interceptions) and a newly-minted starting quarterback TJ Pergine, who’s second in the PAC in passing yards (411) and third in touchdowns (5). “Our defense has played well,” Brubaker said. “The best thing is how well they run to the ball. We’ve been tackling pretty well and there’s two real positive things. We’ve been able to create turnovers the first two games and that will be the key Friday night. Forty-five minutes east, Perkiomen Valley will be tested by the arm and legs of Pennridge quarterback Jagger Hartshorn, who has been nearly unstoppable for the Rams offense, rushing for 379 yards in his first two games with six touchdowns (five against Norristown). Pennridge is coming off a 31-24 loss to Neshaminy, a District 1-AAAA semifinalist last season. “He (Jagger)’s a terrific athlete,” Heist said. “He’s a very good runner. They put him in good situations running the football. He can not only hurt you with his arm strength, but if you don’t keep him in the pocket, he’s going to scramble around and he’s going to do damage. We’re going to have to get 11 hats to the ball, gang tackle, be disciplined and play strong defense. The Gridiron - September 6, 2016 from Ram country TV on Vimeo. ROYERSFORD >> Spring-Ford put its offense into high gear and combined that with another strong defensive outing as the Rams thumped visiting Chester, 55-22 in non-league football action Friday night at Coach McNelly Stadium. The Rams constructed 35-6 lead after one quarter and stretched that margin to 48-6 over the Clippers by halftime. Spring-Ford churned out 189 yards rushing and 149 yards passing to amass 338 yards of total offense. Chester finished with 124 yards rushing and 108 yards passing for 232 yards of total offense. Pergine completed 11 of 15 aerials for 156 yards and three touchdowns and also rushed for two TDs himself. Matt Gibson rushed for 104 yards and one TD. He opened the Rams’ scoring with a five-yard scoring run. Pergine threw touchdown passes to Quinn McKenna, Lee Albert and Stone Scarcelle. Chester quarterback Jamir Green passed for 108 yards and one TD, a 78-yard scoring throw to Braheem Bishop. The Clippers also scored on a 34-yard fumble recovery scooped up by George Johnson and an 81-yard scoring run by Devan Freeman. Freeman totaled 97 yards on the evening. Spring-Ford coach Chad Brubaker was happy with the Rams’ progress as they have been improving week to week. The Rams got sacks from Tanner Romano and Dean Costalas. Dan Cassidy and Tyler Edwards forced interceptions. Pete Agler made some big tackles on special teams to set the tone in the early going. He said Chester wants to play teams like Spring-Ford and Haverford in order to keep improving. For Chester, Tahiaj Cooper intercepted a pass and Rushon Archer had a pair of sacks. The GridIron - August 30th, 2016 from Ram country TV on Vimeo. “The stars might lie, but the numbers never do.” — Mary Chapin Carpenter. Unionville’s Mike Cresta (53) fights in the trenches against the Spring Ford offensive line. Jim Gill photo. First off, the Rams are a 6A school with nearly twice the population of 5A Unionville High. Second, the Indians are a very young team with many new starters, especially on offense. Third, and this was the killer, mistakes, as in too many Unionville miscues to stay with one of the top programs in southeast Pennsylvania. The result, pre-ordained or not, was a tough 33-3 loss to Spring-Ford, Friday night. And while some of the younger players managed to shake off opening night jitters and their lack of experience and play better as the game progressed, key turnovers and mistakes at crucial moments broke open a game that been closely contested. Youth and inexperience reared their head at the worst time, head coach Pat Clark said. Unionville’s Jesse Gill gets to Spring-Ford QB T.J. Pergine. Jim Gill photo. While the 0-1 Indians gamely hung in with the Rams — the Indians managed to stop them repeatedly early on and grabbed a 3-0 lead on a Matt Manwaring field goal. 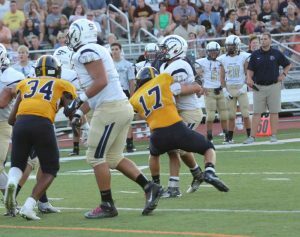 Things started to unravel in the second quarter, when Spring-Ford QB T.J. Pergine — a junior making his first varsity start — started to find his rhythm. Pergine hit Stone Scarcelle with a 49-yard pass, which set up a quick 15-yard TD dash by Selwyn Simpson. In a flash, the Indians’ lead was gone. But Unionville didn’t quit — again the offense got things going, in part keyed by the running of Jack Adams and pushed the ball all the way down to the Rams’ 1 yard line. But then a miscue — in this case — a fumble stopped the Indians cold in their tracks. Seizing an opportunity to take control of the game, Spring-Ford immediately marched down the field behind Pergrine’s arm — a 34-yard pass to Quinn McKenna and then a 40-yard scoring pass to Scarcelle to make it 14-3 at the half. 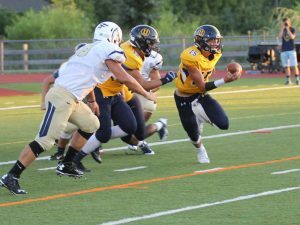 Unionville QB Alex Gorgone looks to evade Spring-Ford defenders — the junior QB had an uneven debut as a signal caller. Jim Gill photo. The third quarter wasn’t much better — and again it was miscues that cost the Indians. QB Alex Gorgone, another junior making his first varsity start, was picked off by Scarcelle, who promptly raced down the field for a score. Two more turnovers in the second half doomed the Indians’ chances of getting back into the contest. Still, with less mistakes a bit more seasoning, this might have been a much closer contest — Adams and running back cohort Dante Graham showed flashes and the defense played well despite battling a larger and deeper opponent. Next week’s contest at the tough Academy Park — a highly athletic team that at times can be undone by mistakes — will need Unionville to clean up some of its issues if it is to post its first win of the season. UNIONVILLE >> A Spring-Ford defense that was consistently stingy last year appears committed for a strong encore. The Ram D, with many returnees from a unit that allowed just 10.6 points per outing in 2015, suffocated Unionville start to finish in the season opener Friday night. They helped blow the game open by forcing three third-quarter turnovers, which led to 13 points and spurred Spring-Ford to a 33-3 victory. First-time varsity starting quarterback TJ Pergine made some big plays and Stone Scarcelle, a major impact guy on both sides of the ball, did damage to the Indians on offense and defense with a 40-yard touchdown reception and 38-yard interception return for a score. Unionville didn’t record a first down until the second quarter. Spring-Ford was finding it tough sledding as well in the early going and the Indians had a 3-0 lead with 8:18 left in the first half. It was then that Pergine, a junior, got in a varsity groove. He found the fleet Scarcelle for a 49-yard play, setting up Selwyn Simpson’s 15-yard TD run for a 7-3 Spring-Ford lead. Spring-Ford’s defense then established the game’s turning point, denying the Indians the end zone after they had gotten a big pass play and advanced to the Ram 2-yard line. 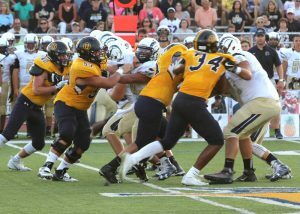 Linebackers Tanner Romano and Ryan Yanulevich along with a host of others pushed the Indians back. Two consecutive losses turned the ball back over to the Rams. Pergine, Scarcelle and senior wideout Quinn McKenna took the Rams right back down the field. Pergine hit McKenna for 34 yards down the left sideline, and on the next play found Scarcelle for the 40-yard score 1:20 before halftime. Pergine showed a knack for buying time in the pocket and delivering the ball deep. Spring-Ford seized the momentum quickly in the third. Scarcelle read the play perfectly and picked off an Alex Gorgone pass in the flat for an easy TD runback. Now it was 21-3. On Unionville’s next possession, Romano recovered a fumble. That and an interception by Dan Cassidy later in the quarter, on a deep ball near the goal line, led to field goals by Erick Rodriguez. “We owe it all to the coaches and all the preparation we do,” Romano said. The Indians lost a bunch of skill-position players from an 8-3 club and might take some time to find their way offensively. Unionville junior running back Jack Adams had some nice second-half runs but the Indians never could crack the Ram D for a sustained stretches. The Indians’ D did do a good job thwarting the Spring-Ford running game. Spring-Ford had a 59-yard TD run by Selwyn Simpson in the first quarter called back for a hold, and the Rams couldn’t find much room between the tackles most of the night. The GridIron - August 26th, 2016 from Ram country TV on Vimeo. The two principles were evident in last year’s Spring-Ford seniors that led the Rams to an undefeated league record and the team’s first PAC-10 Championship since (2011). Now, this year’s seniors are waiting for their chance to pen another chapter in the Spring-Ford record book. Friday night at Unionville, they get their first chance. The Rams face a Indians squad that has plenty of fresh faces, yet plenty of talent. The Indians graduated 20 seniors from last season — including every skill position starter — on a squad that went 6-0 in the Ches-Mont American Division. The linebacker corps of Trevor Gardiner, Jesse Gill and James Watson headline a defense that will look to slow down a Spring-Ford rushing attack that averaged 202.8 yards rushing per game in 2015. It’s a group Rams senior running back Matt Gibson is looking forward to running against. This year marks the first year of the new PIAA classifications and the four-game non-league schedule for members of the PAC. Are the players excited? They sure are. “Starting tonight (Wednesday night), the plan is to drink a lot of water, Gatorade, eat a lot of pickles,” Gibson said. UPPER PROVIDENCE >> Pottsgrove High School enjoyed a banner day when it came time for special awards during the 29th Annual Pioneer Athletic Conference All-League Banquet Sunday afternoon at the Rivercrest Golf Club. Pottsgrove defensive end/tight end Chris DeFrancesco won the David L. Freed Award; running back Tyrell Barr took home the Joseph Edwards Scholarship; and offensive tackle Jake Adams captured the Bill Rogers Lineman of the Year award. Also receiving high honors as a multiple award-winning school were Perkiomen Valley junior quarterback Stephen Sturm, Most Valuable Player; junior wide receiver/defensive back Justin Jaworski,Two-Way Player of the Year; junior running back David Williams, Offensive Player of the Year; and Spring-Ford linebacker Steven Rice, Defensive Player of the Year. All awards were voted upon by the PAC-10 Football Coaches Association, which also selected first team, second team and honorable mention all-star recipients for both offense and defense. DeFrancesco is undergoing chemotherapy for a 6-to-8-week period to deal with testicular cancer, which represents a testament in courage and fight to overcome adversity that no scholastic student-athlete should ever have to deal with. Pottsgrove head football coach Rick Pennypacker told the story of DeFrancesco’s career, both from an athletic standpoint as well as his battles with cancer that arrived at age 17 and other physical issues with his leg and ankle. Spring-Ford head football coach Chad Brubaker first explained the criteria for winning the David L. Freed Award, which is named in memory of former Spring-Ford lineman David Freed, who died from head injuries suffered in a 1975 practice incident on a machine that is no longer manufactured. Despite numerous setbacks along the road, DeFrancesco has maintained a positive attitude and has continued his diligent work ethic as a star member of both the Falcons’ football and wrestling teams. DeFrancesco received first team all-league honors as a defensive end. Barr was named a first team all-league running back. Adams received first team honors as an offensive lineman. DeFrancesco has spent an extraordinary amount of time in the weight room while preparing for rigors in two scholastic sports during his high school career – football and wrestling. Because of the extensive media coverage the DeFrancesco case has received, and because he is such an admirable student-athlete on top of it all as a special person, DeFrancesco has been constantly receiving best wishes from students, players and other coaches he does not even know. Following surgery, DeFrancesco still made it back on the football field two weeks later to compete with the rest of his Falcon teammates in the District 1-AAA playoffs, a testament to his fight then and now as his battle continues. Barr became a primary focus of the Pottsgrove offense this season as a durable running back. Barr is originally from Phoenixville, where he first played football in the 60-year-old Phoenixville Marian Youth Club (PMYC) youth sports program. Tyrell’s father, Timothy Barr, played sports at Phoenixville and is still employed there at the Good Samaritan Shelter. Tyrell’s uncle, Harry Barr, still holds the Phantoms’ school record for the 100-yard dash, which is in the area of 9.8 seconds. Barr has enjoyed being part of the traditional football success that Pennypacker’s teams have created at Pottsgrove throughout the entire program. But it has been more about learning life’s lessons from the game of football, like the values of hard work, dedication and teamwork and friendships, moreso than the wins and losses and individual statistics from any single game or season. His future plans include majoring in applied mathematics at either Princeton University or Temple University in the pursuit of becoming an actuary. Perkiomen Valley head football coach Scott Reed bid farewell to the PAC-10 football fraternity after stepping down after 12 seasons to devote more time to his own kids and family. Reed guided the Vikings from 2004-15 and compiled an overall record of 82-53 while winning two PAC-10 championships. He also led PV to four District 1-AAAA playoff berths. This past fall, the Vikings went neck-and-neck with Spring-Ford throughout the season before the Rams won the showdown contest between the two schools in the last week of the campaign as well as the league championship. PV did win one game in the district playoffs. Reed noted that he has been fortunate to have coached some outstanding athletes. He said he has also been blessed to have four assistant coaches who have been so loyal and faithful to him, as well as becoming great friends. The PV assistant coaches include Jason Basile, Matt Young, Tim Connolly and Rob Heist. Reed will remain active as a basketball official during the winter months. As coach of the league champions, Brubaker also gave a speech. He said the PAC’s reputation in football is enhanced by how teams perform during the playoffs. Brubaker congratulated PV on its district playoff victory. He also said the Rams are very excited about the league’s expansion next year, when Norristown and Upper Merion will be added to the loop. The 12 member schools will be divided into two divisions of six teams per side, based on larger and smaller school enrollments. Brubaker said the new schedule will allow teams to play some interesting, high quality non-league games. Brubaker said he, too, has been blessed with top athletes as well as fine assistant coaches. The rest of the Rams’ staff includes Steve Schein, Steve Moyer, Jim Mich Jr., Chad Strickler, Chuck Nesley (first year with SF after a tenure at Owen J. Roberts), Jamie Gray, DJ Fox, Dale Bergman and Mike Engro. Brubaker said football is a great game that has come under attack because of the number of concussions involved. But he also pointed out that a high number of safety precautions have been taken to prevent severe head injuries, including upgraded helmets. Game rules, he said, also allow for safety measures at a higher rate while dealing with the nature of football. Brubaker said an objective report would show that head injuries can be as serious in some other sports as they are in football. The PAC All-Academic Team was recognized at the banquet. Those student-athletes are: Quinn Hair, Boyertown; Nicholas Ross, Methacton; Conor Mitchell, Owen J. Roberts; Eddie Landherr, Perkiomen Valley; Cory Bird, Phoenixville; David DeBias, Pope John Paul II; Max Stump, Pottsgrove; Brandon Tinson, Pottstown; Jason Wilson, Spring-Ford; and Mahlon Schaffer, Upper Perkiomen. Notes >> Dave Reidenouer, executive secretary/treasurer of the football coaches association, gave opening remarks and introduced guests. … Boyertown football head coach George Parkinson gave the invocation, which included a prayer for DeFrancesco’s recovery. … Perkiomen Valley athletic director Larry Glanski serves as PAC-10 athletic director liaison. Venuto Recognized by Burlsworth Foundation! Congratulations to Ricky Venuto, who was recognized by the Burlsworth Character Award Foundation for sportsmanship and character in high school football. His name and Spring-Ford football will be listed in the credits for the movie Greater, coming nationwide to theaters January 22, 2016.